1. I think St. Valentine's Day is for everyone, whether you have a romantic love interest or not. I received a Valentine card from my sister (thank you Patti!) - case in point. It is all about LOVE, not just romantic love. What are your traditions for celebrating Valentine's Day? I usually buy chocolate or some sort of little gift for Karl and Josh and then sometimes we go out to eat. Nothing crazy. 2. 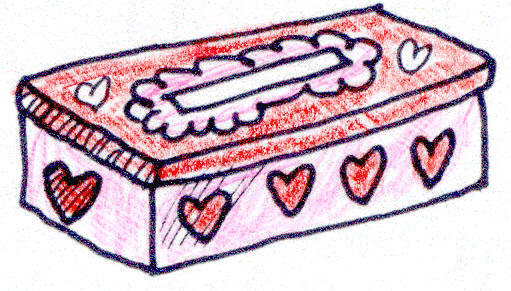 When you were in elementary school, did you decorate a shoe box and deliver those little valentines to all your classmates? Perhaps in Sunday School? Yes! I had a nice box in school for Valentine's Day. Since I teach preschool, I have been helping the kids make a little folder for their Valentine's they will get from friends to take home. 3. Do you enjoy playing Cupid? Have you ever introduced a couple who really clicked? I do not do that. 4. Which traditional Valentine's Day gift would you rather receive: Chocolate, flowers, or a card with a personal message? Karl usually gets me all of those things. I really love flowers! 5. What is the best movie to watch on Valentine's Day? We do not watch anything special for Valentine's Day. Just whatever our shows we watch that are on...normal day for us. 6. Tell us something random about your week! The weather is still crazy! It was super cold on Monday...ice on Sunday and tomorrow we will have sun and 60's! I have been busy at work getting things ready for the Valentine's Day party for the kids. It will be fun. Valentine's Day is plain here too. I am doing things for the grand doll but probably no one else. Thanks for joining in today! Enjoy your Valentine's Day festivities with the kids and then with the family! THe weather is crazy here too! So sweet that your hubby gets you ALL the gifts! We don't watch anything special for Valentine's Day, either...I didn't think of the question that way. And we're definitely not watching anything special this year because it's A Million Little Things night!